www.DiverseTips.se: Nyheter kring skrivare i Windows8 / Windows server 2012. Nyheter kring skrivare i Windows8 / Windows server 2012. 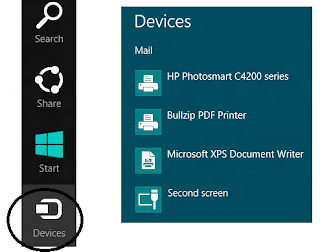 Clients can use enhanced Point and Print to generate print jobs that the server can use without using a device specific driver. Servers contain the configuration and capabilities of the printer and communicate that data to a client computer in a way that the client can use without needed a device specific driver. With the new v4 driver model the print server will no longer be a software distribution mechanism. Previous versions of Windows provided a method for print clients to obtain a driver from the print server. This functionality has been removed for enhanced point and print. Several reasons brought this change such as security, compatibility, serviceability and reliability. Down-level client computers like Windows 7 will still be able to receive the enhanced Point and Print Compatibility driver from Windows Server 2012 to enable compatibility with v4 print shares. Client computers running Windows 8 have enhanced Point and Print support built into the operating system, and they can use standard point and print mechanisms to obtain matching v3 drivers if the administrator wants to continue using older drivers. Device specific v4 drivers can also be deployed to Windows 8clients, or downloaded from Windows Update/WSUS in order to provide additional features or capabilities, such as client side rendering when connecting to enhanced Point and Print shares. Men läs artikeln ovan, det är bättre beskrivet där (det är därifrån jag kopierat texten). Där finns även en länk till ännu mer information.